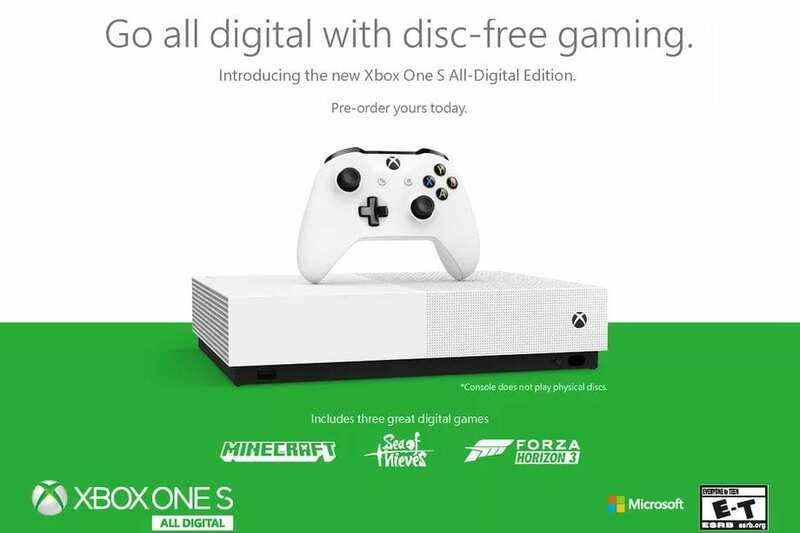 It has been rumored for some time, and although everyone knew the rumors were true, Microsoft has officially announced the Disc-less Xbox One S and confirmed that it will be releasing on Tuesday 7th May. The console itself looks exactly the same as the standard Xbox One S but with the disc tray missing. When asked why the console wasn’t reworked to have a smaller size (since the disc tray took up 18.6 percent of the original) Xbox said “Reworking the motherboard and chassis, we could get to a smaller form factor, but that time and engineering cost would make it less attractive from a consumer-value standpoint”, which essentially means it would have cost more. The All-Digital edition will launch with a 1TB HDD and has an MSRP of $250. Now, for those of you out there thinking that you can pick up a standard One S for just $200, so why would you pay more for one without a disc tray? Please bear in mind that $250 is the MSRP, and the MSRP of the regular One S is $299 i.e. you’ll usually only pay this price if you’re buying it direct from the Microsoft Store without a sale being on. During the Inside Xbox live stream, Xbox said that they will be trying to ensure the All-Digital Edition is always $50 cheaper than the standard edition, so if your local game shop is selling the regular console for $200 you should expect to see the All Digital Edition selling for just $150. Three free games will come pre-installed on the console. These include Minecraft, Sea of Thieves, and Forza Horizon 3. Forza Horizon 3 is a strange choice considering Forza Horizon 4 has been out since October, but I think it might actually be a clever play by Microsoft; obviously the whole premise of the Digital Edition is to get more players on to the Xbox Game Pass, and the service allows you to play Forza Horizon 4, so the chances are if you like FH3 you’re going to be signing up to the Game Pass to play FH4, especially considering you also get a code which provides you with 3 months access to the Xbox Game Pass for just $1. Personally ,I won’t be getting an Xbox One S All-Digital Edition, but that’s because I have an Xbox One X. If I was still on the original Xbox One then I might consider it, as I’m more than happy to purchase all my games digitally. In fact, I prefer it. What about you? Are you looking to get an Xbox One S All-Digital Edition? Let us know in the comments below.